The Great Barrier Reef is made up of over 900 islands but only some of them are good for visiting, staying on, exploring and playing on. Many of these more popular islands are located a short boat ride away from Cairns. You can visit these islands from the mainland on a day trip or some offer accommodation so that you can relax and unwind in one of the Seven Wonders of the World. Some islands come complete with golf courses and 5 star dining and others are a little more private and perfect for a reclusive holiday. Many of the islands have have wonderful National Parks which you can trek through and enjoy the native flora and fauna or you can enjoy state of the art watersports on the larger resort islands. if you're there for a romantic getaway, family fun filled holiday or a trip away with friends there's an island to suit your needs. There are two different types of islands on the Great Barrier Reef - continental and coral cays. The continental islands are actual bodies of land that sit on the continental shelf of the continent. These were formed thousands of years ago when coral grew on the hills due to the rising sea level. The cays are sandy islands that have formed on top of coral reefs. These islands have been known to the Aboringals and Torres Strait Islanders for over 40,000 years and are very special places both historically to these people and ecologically to the environment so make sure when you visit you treat the islands with respect. Green Island is a coral cay located about 45 minutes by boat from Cairns. It's a beautiful spot with golden sand beaches surrounding what looks like a totally green island due to the abundance of National Park - this apparent greenery might be the reason why Captain Cook named the cay Green Island. Holidaymakers have been coming to the island since the late 1930s when there was a small guesthouse, now there is a 46 luxury resort where people can holiday. The Green Island Resort is eco friendly and has lots of activities to keep you occupied like a licensed bar, alfresco dining, shopping boutiques and a gorgeous pool. The island is also a wonderful place to visit if you're just day tripping around so combined with the great resort it makes it one of the most popular destinations in the Great Barrier Reef. Experience the natural wonders of Cairns from the Great Barrier Reef to the lush rainforests on this fantastic day tour package. The complete reef and island experience in one day awaits with this exciting cruise! A fast 45 minute catamaran ride across the Coral Sea from Cairns will take you to beautiful Green Island to enjoy two hours on this unique reef and rainforest coral cay. Your Green Island Discovery includes both snorkelling and an informative glass bottom boat tour to fully experience this beautiful Great Barrier Reef island. You can enjoy up to 7 hours on this island paradise. Your Green Island Eco Adventure gives you the choice of a glass bottom boat coral viewing tour or snorkelling equipment. Choose your way to experience the reef – stay dry and view from a glass bottom boat or choose to snorkel directly from the white sandy beaches. Fitzroy Island is a continental island located 45 minutes from Cairns. Much of the island is protected by the Nature Conservation Act of 1992 so it's a no go zone for visitors but there is still heaps to see and do on the western side of the island. Visitors can walk on designated trails that take you from the northern end of the island, past the lighthouse and to the island's highest point which gives you a great 360 degree view of the region. The best snorkelling and sand beach is located at Welcome Bay you can literally walk from beach to some awesome fringe reef. Here you'll also find the Fitzroy Island Resort which has a range of accommodation types from luxury ocean suites, backpacker hostel type rooms, beach cabins and quarters for divers. There's lots to do at the resort including a great night life scene at Foxy's Bar and Cafe. Day visitors are also more than welcome to come and enjoy Fitzroy Island. Ferry transfers to and from Fitzroy Island can be bundled with a host of exciting and relaxing activities including picnic lunch, snorkelling, glass bottom boat cruises and calm water kayaking. Check out the options available and book online now! The islands that make up the Frankland Island Sector are High, Normanby, Russel, Round and Mabel and are all totally uninhabited, except by the local animals. They are located only 10km offshore from the mainland and are a popular recreational spot for fisherman, local boat owners and also tour operators who also do take visitors out to these interesting islands. Russell Island is one of the most popular islands and has 6 campsites. Russell Island makes for a popular home for a lot of marine life however the Green Sea Turtle also makes Russell its nesting spot. There is one tour operator who takes daytrippers to Normanby Island for a river, reef and island adventure. The Low Isles is made up of two separate islands, Woody Island an uninhabited island and another Low Isle which is the main reason tourists come out here. Low Isle is small, coral cay and is surrounded by fantastic tropical reef. The island is picture perfect and a great place to visit for a day of snorkelling and diving. On the island is an active lighthouse which was built back in 1878. This lighthouse was the first of its kind in Far North Queensland and helped lead boats through the Great Barrier Reef Inner Passage. Not a confident swimmer, but want to experience the Great Barrier Reef? At Low Isles you can snorkel straight off the beach, enjoy coral viewing on a glass bottom boat, take a leisurely guided walk around the island or simply relax on the sandy beach. Do as much or as little as you like! Lizard Island is one of the most secluded and luxurious island's in the Great Barrier Reef system. The hotel has garnered a number of awards and is the perfect place for a romantic holiday or quiet relaxing time with friends. There are 24 white sand beaches and 40 suites so it is near impossible to run into your neighbour. Guests to the island travel to the island via air from Cairns Airport and land on the Lizard Island Airport. The island was not always a playground of the rich it was also very special to the Dingaal Aboriginal people as it was the place of initiation for the young males of the tribe. They believe that Lizard Island and the small islands that follow on from it were created in the Dreamtime in the shape of a stingray. For well over 100 years people have been escaping to Dunk Island for peace, tranquillity, fun and to enjoy island life. The resort we see today has changed dramatically since its humble beginnings which grew up around famed author and naturalist EJ Bamfield. The island has changed many hands in its life and was once the playground of the rich and famous like Sean Connery and Gough Whitlam. It then became a family friendly resort with lots of land and water sports. In 2011 Cyclone Yasi devastated the island and due to the inclement weather since and costs the privately owned island has sadly not begun refurbishment. Double Island is perhaps one of the most exclusive in the Great Barrier Reef series and was once only available for private whole use however now it is opened its beaches up to those just wanting to get away with a loved one, family or friends. The island only takes 20 minutes to get to from Palm Cove by boat or 10 minutes from the mainland. The island wasn't once so fancy as it was also the site of gold mining back in the 1880 and 1890s and was also a popular place to graze cattle. Haycock Island is Double Island's neighbour and can be seen from the shores of Palm Cove. It's more commonly called Scout Hat Island as it looks just like that, an oversized scout hat sitting in the water. There's not much to do on this island but it is known for its great fishing. 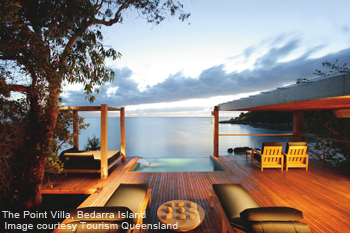 Bedarra Island is home to a stunning 5 star resort and known the world over for being one of the most exclusive and desirable places to stay. It's a granite island and is located in the centre of the Family Islands National Park. The island was privately owned by landscape artist Noel Wood in the 1940s and then later became an internationally acclaimed resort. A daily 30 minute launch service operates between Mission Beach and Bedarra to get you there. Cyclone Yasi had a devastating effect on the island, which stormed through Far North Queensland in 2011, however re-vegetation efforts have been undertaken since the cyclone with the island restored to its former . Hinchinbrook Island is the largest island on the Great Barrier Reef and is mainly covered in National Park except for the small Hinchinbrook Island Resort and Orchid Beach. It's a beautiful island to visit if you are looking for an eco friendly holiday with gorgeous activates like trekking through the rainforest, bird watching, reading on one of the 11 sandy beaches and watching sunset from the Island's summit. A new discovery on the island which was uncovered by Cyclone Yasi a shipwreck thought to be around 130 years old. Only 40 people per day can visit the island so make sure you book your trip early. Orpheus Island is one of the most stunning island's in all of the Great Barrier Reef and is mostly covered in National Park except for the small privately owned resort. There are 7 beaches around the island and off these sands is thought to be the best coral in the entire Barrier Reef Marine Park. Romantically speaking this could be caused by the ancient Greek myth of Orpheus calling all natural things to the island with his lyre. The resort is currently undergoing a major transformation which will make it one of the most desirable islands to visit in the Great Barrier Reef. Getting to the islands is relatively easy as there are many privately owned tour companies operating to and from certain parts of the mainland to whichever island takes your fancy. Many of the islands which have resorts will offer pick up and drop off services so make sure when you're booking your accommodation you check yourself in for this service. Lizard Island is one of the only islands with its own private airstrip however you can get to other islands via seaplane or helicopter. Not all the islands offer acommodation facilties but those that do are rich and varied. Some island's cater to an exclusive few with luxury beach villas, private eco friendly tents, backpacker and divers quarters, three bedroom resort rooms for families and even some camping facilities. Many of the resorts were hit by Cyclone Yasi so make sure you check to see if they have opened their doors up to the public again.